In this example you see that the server wasn't available during 20:24 - 20:28 . Since I provide COTS (Commercial off the shelf) I'm wondering if this chart really provides useful UI and information. Do you think so? The illustration in the question requires too much thinking. The linear time line works well for a 24 hour timespan. An aside: COTS stands for Commercial Off The Shelf. Per the chart - it tells me nothing. Both the X and Y axis are so deep I have to following an enormous gulf in order to guess that the server was down roughly in the timeframe of 20:24-20:28. Why are there 4 lines in-between the hour lines when they only jump by 2 hours? My eye also has to wander a great deal, and I have to think a lot, in order to pull out a timeline from this chart. Times earlier in the day are in the lower right with times later in the day in the upper left. 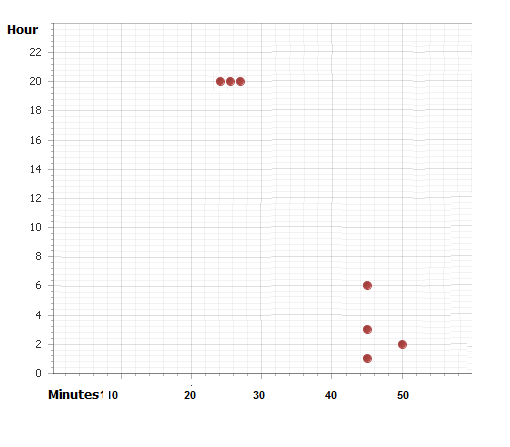 Add a bunch more dots and the user is going to freak out trying to figure out time blocks. A simple listing when a server went down, and when it came back up, would be easier to read and take up less space (assuming your server isn't going down an enormous amount). Fancy visuals do not necessarily make information easier to parse. If you really must have one, show something that presents the information in a linear progression - such as a timeline - which is how people see time. Not the answer you're looking for? Browse other questions tagged info-visualisation charts timeline or ask your own question. How to display more than 20 data sets? Graph values inside a set of values, best way to display? How to show that a chart is a zoomed-in version of a different one? Best way to show your skills on a resume? How to represent a latency chart? How to show time-breakdown × availability from multiple parties in Web App? Which of these cryptocurrency charts communicates percentage gain or loss in the most clear manner?